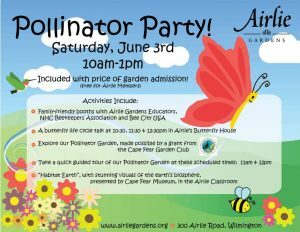 Come to Airlie Gardens for a Pollinator Party featuring information from NHC Beekeepers Association, Bee City USA and Airlie educators. Butterfly releases, Pollinator Garden tours and digital-dome showings of the film Habitat Earth will take place throughout the day. All activities are free for Airlie Members and included with paid garden admission.